Okay! Musume Time: It's Time for a Change! Houkago Princess LOVE 3.0 is Here! It's Time for a Change! Houkago Princess LOVE 3.0 is Here! I'm back with another update (okay, that makes this my third update-related post in a row! I include Michishige Saho's Coronation announcement as an update as well, albeit an Idol-related one) and I do admit, the next post I plan to do may also be announcement related as opposed to a Review of some kind. That said, things have happened that I find exciting and update-worthy, so there we go. I'll try and get a Review out at some point, but I've recently hit a bout of depression (what I would call a 'slump') and have not wanted to write at all, do any videos, go out, get out of bed... things like that. The only piece of solace I have had during this period of nothingness is, in fact, Houkago Princess, and interestingly enough, I've been rather active in my HouPri Love adventures, it seems, hence this post. So, without further ado, I want to introduce to you all Houkago Princess LOVE 3.0!!! For those who can recall, I have an English, unofficial fansite for Houkago Princess that I try my best to update on a regular basis. Early on this year however, I ran into some issues with the website provider that I was using, IM Creator, and its formatting. The website is easy to use and was great for whatever I needed, however after some time it just started to mess up the format of the pictures and text and place them one over the other, no matter how much I tried right what had been done wrong. So, after becoming annoyed one too many times with the site, I decided that it was time to move on and find another website to host Houkago Princess LOVE. And now, I have turned to Wix, and so far it's doing just what I want it to! Hoorah!!! I've really enjoyed creating the layout for the 3rd version of this website actually, however I know that if I want to add more features in the future (my plan is to eventually start a Houkago Princess LOVE forum, attached to the site, and to add a blog for translations... I'd need a translator for that, however) I may have to move somewhere else, or eventually try something completely different. I have an idea for what I want, but right now, wix is a great site for the design and style I have wanted. And, if I do say so myself, I think that right now the website looks rather splendid! I've still got some things to do, such as adding the former members' profiles to the website as well as adding Discography information and a Lyrics archive, however right now the site has the bare bones information that, in my opinion, is the most important aspect of it. For anyone who dares to take a look at it, I would like to ask you of this: If you see anything wrong, or if you think that I could add something to it you might find important, please, let me know. I want to improve on this site and build on it to become far more suitable for the Western fan community. This is something that I truly want to share with many others, and I want to make it as accessible as I can for the Houkago Princess fans. I may not be the best website creator, but I do want to create something that others can look at and enjoy, and hopefully, share. That is all for now. Please, do take a look at the fansite and see what I can do to better it, and of course, feel free to comment or not! Until next time, everyone! Take care, and love your Idols to the fullest! On the homepatch all da little piccies have their wordzles (the pinky titly wordzles) line up on their piccie, which looks nice 'cept "Lyrics" is not behaving and could use a bit'va spronging down. Do you see this error? Also, in the second paragraph of the introducky descripty words there is a "t" missing from the word "thirst." 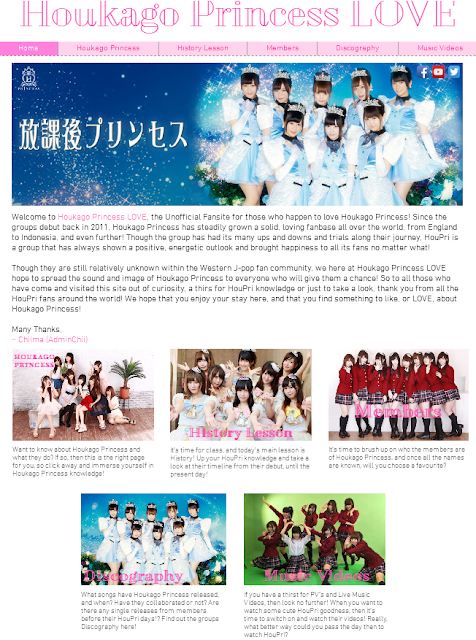 It currently saybies: "So to all those who have come and visited this site out of curiosity, a thirs for HouPri knowledge..."
My one suggie gestion would be to mayplee add a link to a forums where HouPri fans can callawang together and swug! Surely there must be such a place already existencing to refer them to or if they's not - make one up?! I have not readdied over every of the other pages but I browsed through and everysing else looked very nice and neat. You really did a wham-funtastical job! Superbliness! Tangy-tang and lemonzest! I have many a catching up to do! I am go getting a food and then reading all the nicely, superbly O!MT Chiimainess I have been missing, missing, missing! I have a thirs for it! Updates in Life: My Sister's Wedding!